Now that college students have finished their finals and high school students are going to prom, the summer season is truly about to begin. The City of Pittsburgh is ready to celebrate the sunny months with some free outdoor events. Typical summer events — like the Independence Day celebration and the Pittsburgh Three Rivers Regatta — aren’t the only entertaining functions to hit the streets of Pittsburgh in the coming months. Pittsburghers and guests to the City alike will have the opportunity to take in the cobblestone roads of Market Square and the sights of Schenley Park — with some added summer fun. Beginning May 31 at Market Street Grocery, the Market Street Block Party brings the atmosphere of a happy hour into the streets in Market Square. There will be a series of these block parties throughout the summer, so don’t worry if you can’t make it — this event is just the beginning. The first block party will feature food and drink from the Market Street Grocery and host live music, including artists like California-native The Whooligan. This year will be the sixth consecutive production of the Deutschtown Music Festival. The festival will take place on the North Side July 13-14, when guests can expect to enjoy more than 200 bands. The festival this year features outdoor and indoor stages, with the one main stage at Allegheny Commons Park and another on Foreland Avenue. Food trucks and family-friendly activities will be available both days of the festival to entertain guests of all ages. In the evenings, bars and clubs will be participating in the festival, hosting indoor performances close to the outdoor mainstages. Why pay $10 per ticket to watch a movie when you could lay a blanket down on the lawn of one of Pittsburgh’s parks for free? 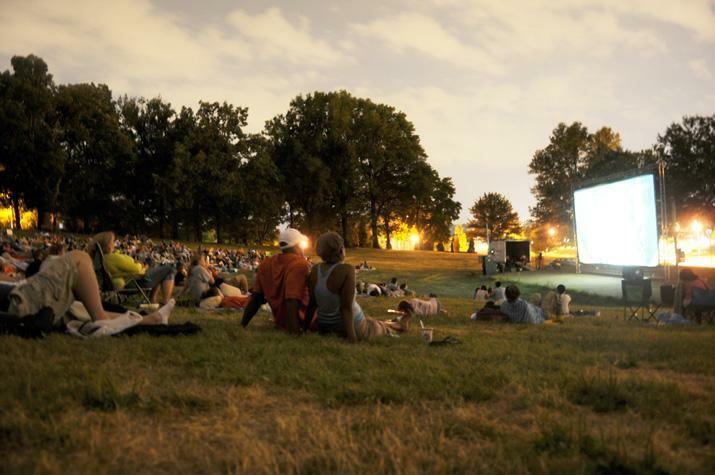 This year’s locations for Cinema in the Park, sponsored by Dollar Bank, include Schenley Plaza, Schenley Park at Flagstaff Hill, McBride Park, West End Overlook, Brookline Memorial Park, Arsenal Park, Grandview Park and Riverview Park. Each screen will show films from the same rating category. For those Pitt students staying close to Oakland for the summer, films of the PG rating will play at Schenley Plaza Tuesday beginning with “Deep” June 3. PG-13 and PG movies will be shown at Flagstaff Hill Wednesdays starting with “Dirty Dancing” June 6. All films begin at sundown. Films will not be the only feature at Flagstaff Hill Wednesdays nights — live music will precede the weekly movies as part of the Wednesday Night Concert Series sponsored by 1020 KDKA. Pittsburgh PrideFest is an annual event celebrating the LGBTQ+ community. This year, the event will take place on Liberty Avenue in downtown Pittsburgh Friday and Saturday, June 8 and 9. This year’s musical guests include Kim Petras, Leland and headlining performer Troye Sivan. Sivan will perform June 8 at on the Pennsylvania Lottery Stage at the intersection of 10th Street and Liberty Avenue. Schenley Plaza will house a free music festival hosted by 93.1 FM WYEP radio Saturday, June 30, featuring a number of local and national acts. Headlining acts include Lyndsey Smith, Low Cut Connie, Langhorne Slim and The Lost at Last Band — national acts that all have origins in Pennsylvania. Some local names taking the stage at Schenley Plaza include alternative rock group Kaelber, singer Luke B. Wood and a group from Pittsburgh Creative and Performing Arts school called Colorblind Coding. These performers are representing a development program for young artists called Reimagination. Three Rivers Arts Fest is another annual event held in the City. Taking place Downtown, mostly in Point State Park, the festival brings numerous musical artists, art vendors, food trucks and lemonade stands to the City. The festival kicks off June 1 this year and continues for a full 10 days. Some of this year’s highlighted musical guests that will perform at the Dollar Bank Mainstage at Point State Park include Mavis Staples, Everything Everything, the Pittsburgh Symphony Orchestra, The Mendelssohn Choir of Pittsburgh, Sidewalk Chalk and the Mavericks.